National newspapers need to model themselves on local and regional titles in order to address the issue of public trust according to a leading Labour politician. Greater Manchester Mayor Andy Burnham was taking part in a panel discussion on trust in the media at yesterday’s Society of Editors Conference, focusing particularly on the behaviour of the press in the aftermath of the Manchester Arena attack in May 2017. 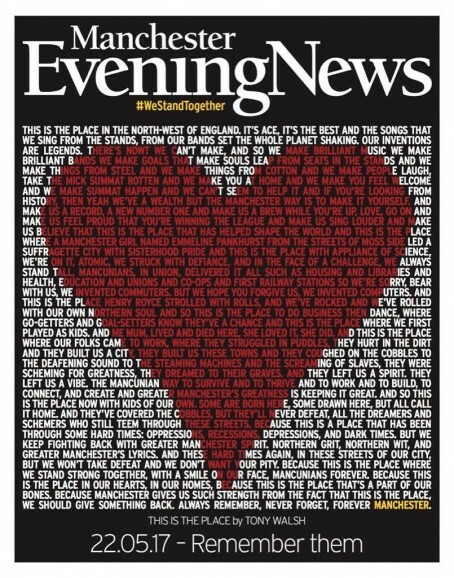 A report by former civil service chief Sir Bob Kerslake was highly critical of the level of intrusion from some media in the wake of the bombing, while also highlighting the “sympathetic reporting” of the Manchester Evening News and other regional titles. Speaking at the conference in Greater Manchester yesterday, Mr Burnham again praised the MEN for its coverage of the incident and urged national newspapers to follow the example of their regional counterparts. “The national media needs to go back to what’s valuable at local and regional level as well as being less London-centric,” he told the conference. But he went on to list a series of misdemeanours committed by journalists in the wake of the bombing, including door-stepping grieving relatives at the airport and offering hospital staff money for information. Mr Burnham was also highly critical of social media, calling for a code of ethics covering social media as well as mainstream print, broadcast and online media. “Social media is changing us for the worse, it is polarising society, dividing society….We have all got to step back, focus on unifying people rather than playing to our divisions,” he said. Spotted an error? Email the editor. You can follow all replies to this entry through the comments feed. This kind of relates to the Dacre piece. Regional and weekly papers might or might not be trusted. Their problem is they are not longer relevant or significant, simply because hardly anyone reads them compared to the peak years. Sales are terrifyingly low to those of us who love local papers. When one regional sells 9,000 a day in an area of about 2 million people you realise the scale of the disaster. I won’t name it, the poor under-staffed sods work their backsides off trying to keep it afloat and it is not their fault.. But it illustrates that you can’t get your message out,political or otherwise, in any meaningful way in a local paper. That is the real world outside the political bubble. The issue is around numbers, as Paperboy says,without the volume of people buying or reading the paper compared to ‘the good old days’ when papers sold thousands upon thousands on a daily and weekly basis, when a local daily was an essential buy and a weekly provided all the weeks local news anyone in the community needed, the fall away is such that, trusted or not,they’ve become inconsequential to local people and as ‘news’ mediums, they no longer have the audience and reach to be effective. Now we want,expect and get our news immediately via a digital device/phone/screen or tablet as it happens and without waiting a day or week to read it. Prospectus good point re digital. There is now a huge loss of “readership” in all mediums because papers are dying and the websites (JP worst) are not user-friendly or older people are just moving over from paper to digital at a quick enough rate. Interesting times. When I started ion journalism in 1965 people looked to their local paper for local news etc. Now, particularly among the young, they interact via social media and think that is news. Don’t forget also that local radio in many parts has come up in leaps and bounds and people do listen to that as well as watch their local TV. Local papers are also “expensive” for many people. My local is part of a bigger group and in its 80 pages about four are devoted to the area I live in despite the masthead using the name of the town – and it costs nearly £2. HoldtheFrontPage is a news and jobs website for journalists everywhere with a particular focus on the UK regional press. The site attracts around 70,000 visitors a month and has more than 18,500 followers on Twitter. HTFP carries all the latest news about UK journalism and our news archive of more than 26,000 stories comprises a unique online record of the UK regional newspaper industry since the site was first launched in February 2000. Our jobs board HTFPJobs contains all the latest journalism jobs searchable by region, category and sector. Job adverts start at £175 + VAT for one week with discounts available for longer periods and block bookings. HTFP contains a wealth of information about the UK regional press including a comprehensive directory of daily and weekly newspapers and websites and a series of other features designed to help journalists in their work.